I have the BBC to thank for introducing me to Haruki Murakami’s work. Someone picked A Wild Sheep Chase for Radio 4’s A Good Read way back in my bookselling days and I was intrigued by their description of it, as were many other listeners: we sold shed loads of this wacky novel by a writer hardly anyone in the UK had heard of at the time. It was actually published in Japan in 1982 but not translated into English until 1989. A Sherlock Holmes-obsessed, chain-smoking advertising executive is pursuing a sheep with a very particular birthmark after pinching an image from a postcard sent by a friend to illustrate some copy. The sheep has been spotted in the photograph by a shady character called ‘The Boss’ who has threatened our unnamed narrator with some very nasty consequences if he fails to track it down. Things become increasingly surreal as the narrator fixes the sheep in his sights on a trail that leads him from Tokyo to the snowy peaks of Hokkaido where he comes face to face with his quarry. There’s a good deal more to it than that but this is a book impossible to encapsulate in just a few words which is part of its charm. I read it with increasingly delighted astonishment. Funny, gripping and wonderfully odd, it’s excellent. It’s well over twenty years since I read A Wild Sheep Chase but I can still remember the excitement of discovering Murakami, gobbling up everything I could find by him. As for A Good Read, it’s still going strong and still well worth listening to for recommendations. This entry was posted in Blasts From the Past, Reviews and tagged A Good Read, A Wild Sheep Chase, Alfred Birnbaum, BBC Radio 4, Haruki Murakami, Japanese fiction, Japenese fiction in translation, Vintage Publishing on 5 March 2018 by Susan Osborne. I’m not the kind of person who’s obsessed with cats. I have one and I’m fond of her but she knows her place – on the sofa most of the time, naturally. I’m fully aware of why the first syllable of ‘Meow’ is what it is – it’s all about them after all. All this rigmarole is by way of self-justification as to why I’m about to review a book about a cat – not the sort of book I ever expected to include on this blog but I was sent a copy, it’s by a Japanese author which always piques my interest and it’s published by Picador whose list I like very much. So I read the first few pages, and here we are. It’s narrated by a man who lives with his wife in the grounds of a large house with a rambling garden. They both work at home: he’s a writer, an editor who’s taken the plunge into freelance writing, and she’s a proofreader. In their mid-thirties and childless, they lead a quiet life, occasionally seeing friends and helping out their landlady. Their neighbour’s little boy has persuaded his mother to let him take in a stray cat. Shy and a little skittish at first, the cat begins to visit our narrator. The couple welcome her, making a little bed for her mindful of her need for privacy, play with her and give her a name: Chibi. Soon Chibi is coming and going has she pleases – which is what they do in my experience – but when their ageing landlady tells them that she plans to sell the house, they know they must move. The beauty of this book is its elegant understatement punctuated by insights into the narrator’s life. They are a couple whose life is a little too quiet, their involvement in their work a little too intense. They seem barely connected to each other until Chibi comes along. Takashi Hiraide’s prose is often very beautiful and a little melancholic – his descriptions of the garden and nature within it arresting. For a Westerner like me, the glimpses into Japanese life are fascinating, further illuminated by a helpful set of translator’s notes from Eric Selland at the back of the book. Towards the end things takes a meta-fictional but not tricksy turn. Short but not slight, it’s a thoughtful rather lovely book. So, I’m glad I didn’t dismiss it but no more cat books: this is strictly a one-off. 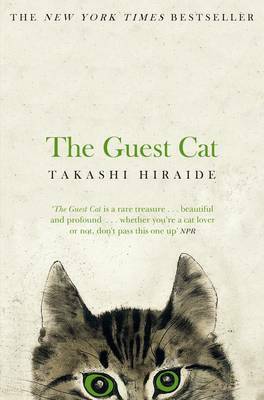 This entry was posted in Reviews and tagged Eric Selland, Japanese fiction, Picador Books, Takashi Hiraide, The Guest Cat on 19 November 2014 by Susan Osborne.